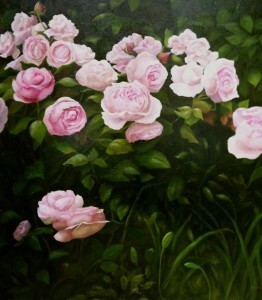 The featured artist for this week’s Art Watch is contemporary realist painter Karen D’Allaird. 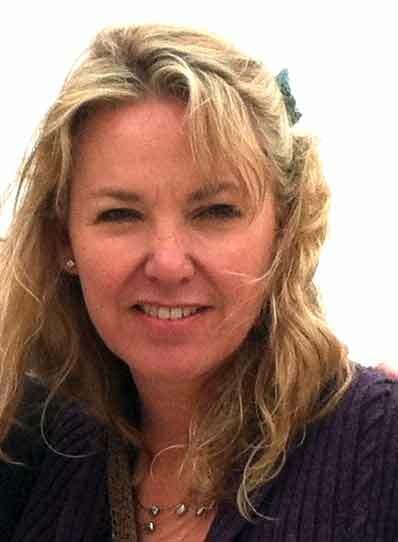 Many of you may know Karen D’Allaird as the founder and teacher of the wonderful Willowdale Art Academy for young students in Kennett Square (www.willowdaleartacademy.com). Karen founded the Art Academy several years ago after heading up the Art in Action Program at Unionville Elementary School, but she has always been passionate about creating her own artwork as well. Following in the Brandywine tradition, Karen D’Allaird is an artist that continues to find inspiration from the rural beauty of her native Chester County, where landscape, floral and still life are among her favorite artistic genres. Karen was trained at Neilson Carlin’s school for classical painting in Kennett Square “Studio Relievo” as well as at the Hussian School of Art in Philadelphia. Her signature work is either her “plein air” landscapes or her beautifully rendered still life compositions. Whether outside in the meadow or inside in her studio, Karen utilizes light and color to capture the movement, beauty, and mood of a subject. In her still life paintings, Karen subjects are all painted from life. The subjects are chosen and composed to reflect everyday pleasures and the balance between the natural world and the man-made, the masculine and the feminine, color and neutrals, as well as textural interest. 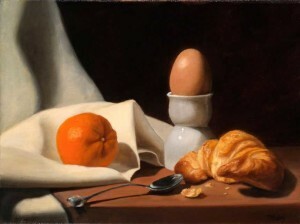 In Karen’s painting entitled, “Eating with Orange”, Karen creates a carefully balanced composition of breakfast foods, presented in a dramatically classical tableau. She captures the color and light of the surfaces and shadows and brings the folds of the white table cloth diagonally across the canvas to accentuate the crisp form of the egg in the porcelain cup. The scene is lovingly presented and keeps the viewer’s eye traveling from one subject to the next. 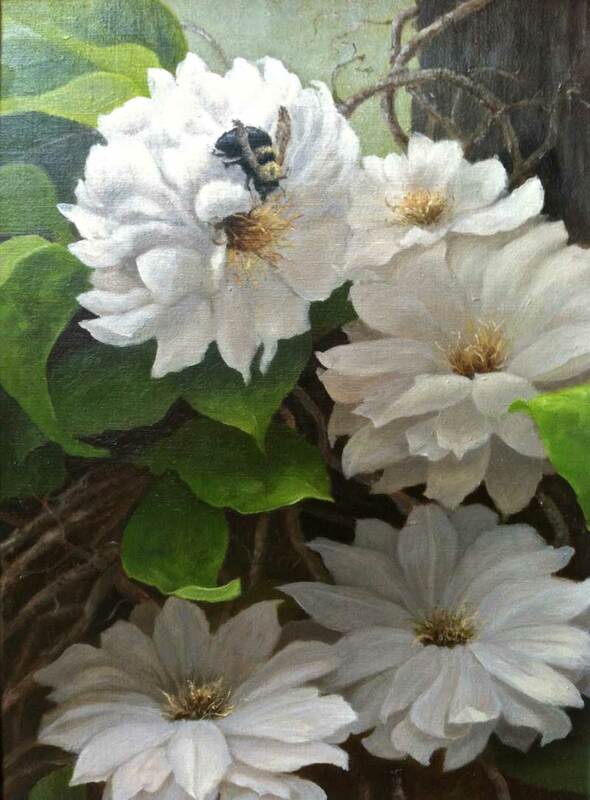 Karen’s beautiful image “Clematis and a Bumblebee” was started outdoors and finished in the studio. Five bright white clematis are frozen in a delicate dance with the light as a bee intently makes its way to the center of the top flower. The painting gives a feeling of timelessness. The petals, leaves and vines of the flowers are captured with a hyper realist technique that takes them from the natural world into the realm of fantasy. The flowers are not light and fluffy, but meticulously shaped and almost sculptural in form. This is a truly stunning piece of art, and she will be displaying this piece along with a selection of other works this Thursday at Galer Estate Winery in Kennett Square from 5-9pm. When I asked her how she ever finds time to do her own artwork after running the Art Academy every day after school, she says, “The Academy gives me the flexibility to do my own work during the day…I have no excuse not to be in the studio!” Recently Karen has decided to start offering her Art Academy lessons to adults as well as school children. She says ” I love my kids. I really enjoy pushing the kids to understand the fundamentals of each of the mediums and bringing out the best artist that they can be. They know that when they get the “Wow!” from me, that they have really earned it, and the beam!” She is looking forward to extending that same experience to adults, and it will certainly be a very popular addition to her Academy curriculum. If you would like to see this wonderful artist’s work face to face, please come to Galer Estate Winery this Thursday from 4-9pm. A portion of the proceeds benefit the Chester County Art Association’s new building fund. Art Watch is a series of articles that highight one local artist every week. Lele Galer is an artist who has chaired numerous art shows, taught art history and studio art, public art and has chaired, written and taught the Art in Action Art Appreciation series for the UCFD schools for the past 12 years. She worked at the Metropolitan Museum of Art, and wrote for the Asociated Press in Rome. She has been dedicated to Art History and art education for most of her adult life. Lele and her husband Brad own Galer Estate Winery in Kennett Square and she is President of the Education Foundation and co-Chairs the CCAA’s New Building Campaign.